For music lovers average music players are not a suit for them. They require an app which will enable them to enjoy their music in the right manner. This though is not restricted to only music lovers but everybody who uses his/her android phone to listen to music. 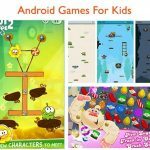 You will definitely agree with me that music lovers will go through the hustles of searching for best android music players. 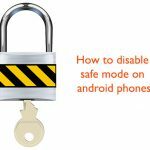 This can be a challenging experience especially when you don’t have the right means and ideas of searching for top rated apps appropriately. In this article this has been made easy for you. 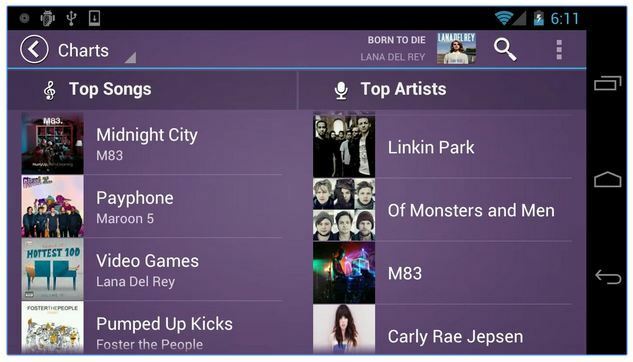 The top music players for android have been reviewed and specific interest details have been indicated. 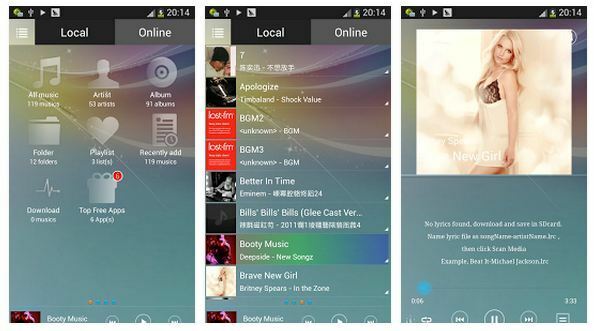 This will help you when choosing a music app for your android phone. 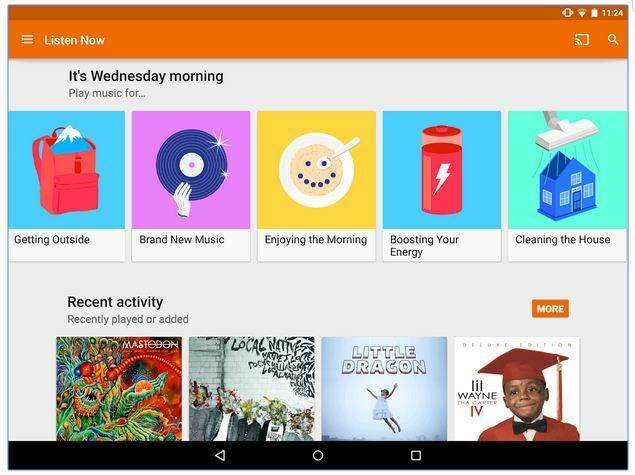 This music app was featured in 2014 best app on Google play. It has the largest lyric catalog. This enables the user enjoys different music with their synced lyrics. If you love specific lyrics, you have the ability to store them in your personal profile found on the music match personal account. For most music lovers, the ability to easily access lyrics of a particular song is a much appreciated feature. 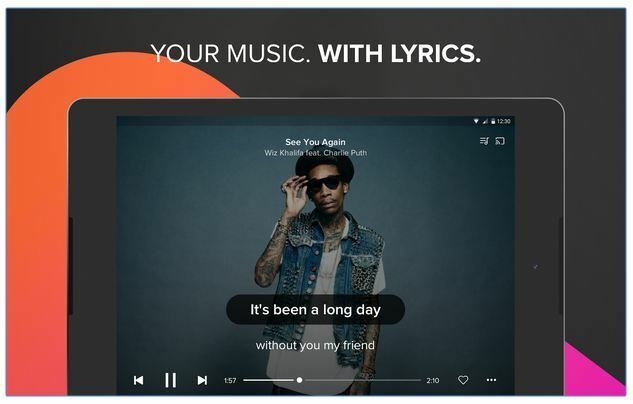 This makes Musixmatch music & lyrics player a must have for music lovers. Ability to identify lyrics for songs which are playing around you. You can search for any lyrics of any song. You have the ability to listen to music library with their synced lyrics. 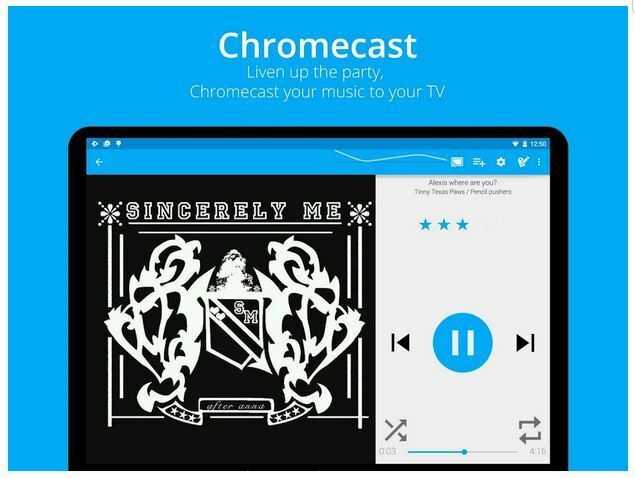 Has the ability to cast lyrics and music to your TV with Chrome cast. Android TV support and Android wear. This music player has a variety of wow features. 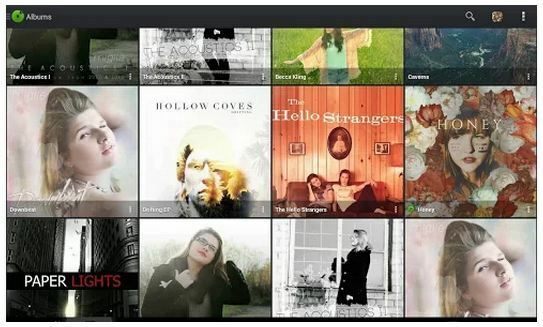 Rocket player is specifically designed for music lovers who appreciate diversity in their music players. This app is available for free download at Google play store but you can also upgrade to premium version. Rocket player app contains over 30 themes. You have the ability to browser a song using the following criteria:artist,song ,album ,folder ,genre ,composer ,podcast & video. Can be customized with 5 bands equalizer which have presets. Has an embedded lyrics support. Has a custom lock screen. Rocket player app is embedded with tag editor for music files. Rocket player app’s equalizer presets includes acoustic, bass booster among others. Rocket player app is both a video browser and player. Increased audio format. This includes:mpc ,wav ,alac among others. Ability to subscribe to a variety of cloud features. This includes- artist pics, auto tag editing, and album art downloading among others. Enjoy ability to assign an equalizer preset to a certain specific song. Ability to make gapless albums in iTunes when you are playing with iSyncr. You can use the reply gain value pre-calculated. 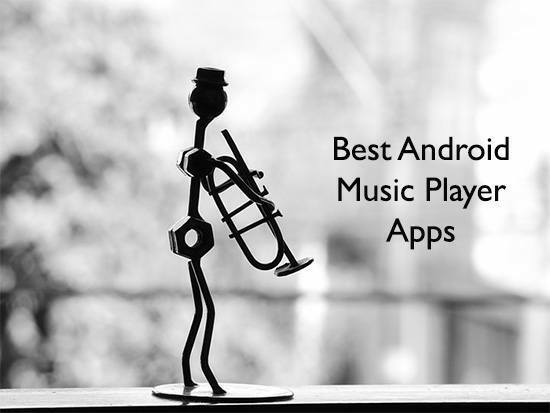 This top rated android music player was voted as among the best app for 2014.It enjoyed around 15 million downloads. The best factor about this is app is the ability to function as a Music player, bass booster and equalizer. This app has been upgrade in 2015 to improve your listening experience. It has a new interface and it is even more elegant. There is a free version and a premium version. This app is recommended to be used with headphones or speakers. Five-band equalizer can be used to adjust your sound track. Has a Powerful bass amplifier. You can access your music library directly from the library. You can set frequencies that you like for certain songs and save this settings as preset. 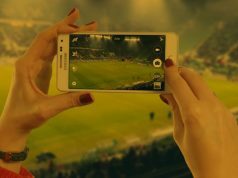 Can connect all you music content by connecting all your appropriate devices e.g.tablets, smartphones and TV. This is through WIFI. You can engage in local music sharing with a network. Has 10 equalizers which are based on the music genres. This includes- acoustic ,classic ,hip hop ,rock among others. Ability to record customized preset with the save option. DJ mode, this ensures smooth string of music. Ability to edit or delete your presets. Jet audio for windows is usually highly rated on a variety of platforms including the likes of CNET.COM. This has been transformed to be enjoyed on your android phone. This app plays almost all types of digital music files. It provides a very high quality sound for these. It has been designed with high quality effects and enhancements which include X-bass, wide among other. It has a 32 equalizer preset which provide a wide array of listening experience. There are basically the free version and the premium version. The main difference is advertising and a number of features. Enjoy ability to choose between 10 grid mode or 3 list mode for your layout style. Find any song in YouTube. Ability to listen to Last.fm – you will require the official Last.fm app. Ability to browse for music using different criteria,this includes: songs,album ,playlist ,folders ,genres among others. Enjoy automatic gain control; this helps you to avoid fluction volumes between different tracks. jetAudio Music Playe has a sleeper timer which can be set up to 24 hours. Shake and your next or previous song will play. Update what you are listening to on a variety of social media platforms. This includes Facebook or twitter. This player has 20 band graphic equalizer. Enjoy a tag editor. This includes in MP3 ,M4A ,OGG,FLAC). Enjoy the displayed lyrics in tags. This player has the ability to utilize two lock screens. This player has an expandable notification bar. Enjoy a precise playback speed control with jetAudio player, This includes 50% – 200%. 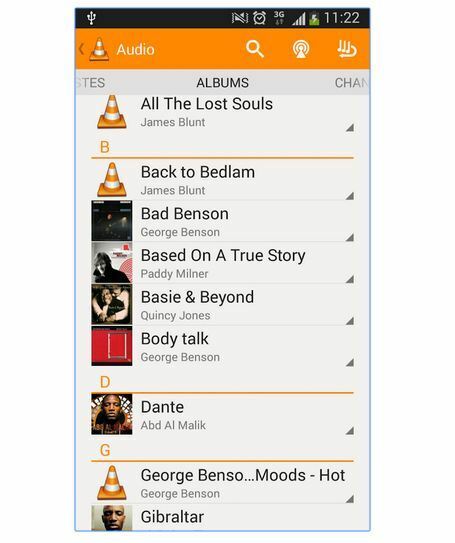 VLC is usually a free and an open source cross-platform used as multimedia player which plays different multimedia files, devices, discs and other network streaming protocols.This top music player for android plays both visual and audio content. Though this version is in the development stages, it has proved very useful to those users who have opted to use it. 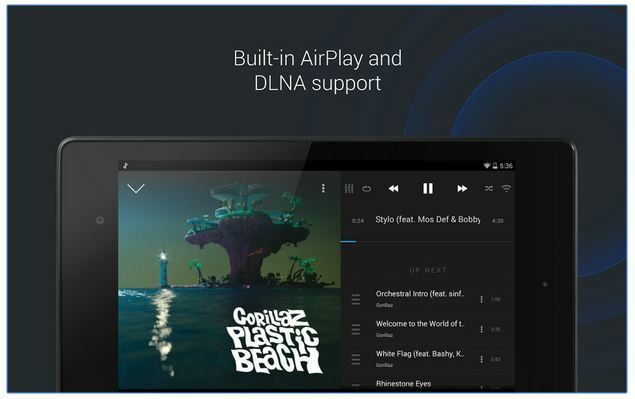 Plays local audio and video files as well as network stream. Has a media library which allows users to browse through folders directly. This player supports multi-tracking audio and subtitle. Supports aspect-ratio ,auto-rotation adjustment and also gestures to control brightness and volume. Has been fitted with a widget which controls audio ,cover art ,supports audio headset control and has a complete audio media library. 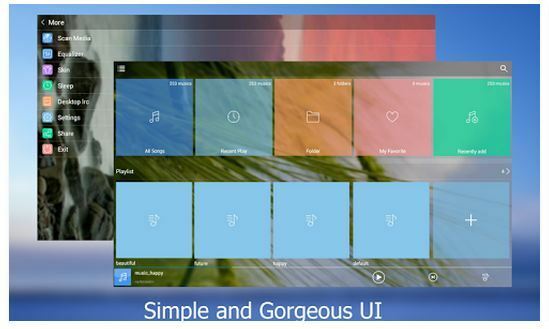 This music player is particularly loved by large number users, this can be attributed to the large variation of amazing features and also the fact that this app is 100% adds free. This player uses a very simple interface which is basically dived into 3 tabs. This includes Library, player and track list. It has a free version and a premium version. 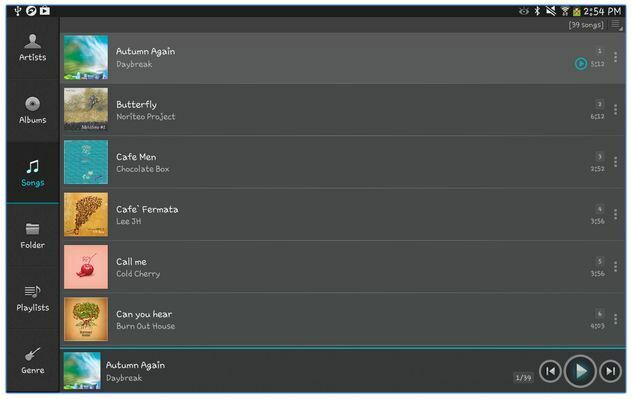 Ability to drag your song from the library directly to the track list. Sensor Music player has an auto playlist editing ability- you can save your track as playlist or even load an existing playlist. You have the ability to browse through music using the following criteria: folder ,artist and genre. 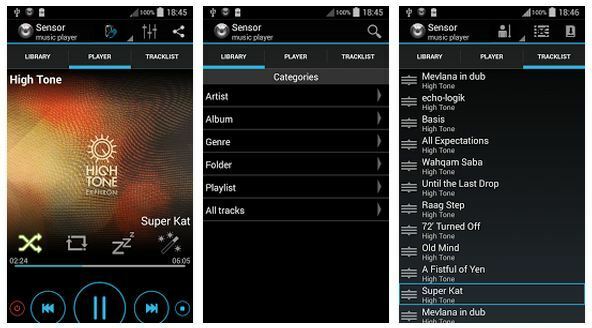 Sensor Music player has an equalizer, virtualize and bass boost. Sensor Music player has been fitted with a smart search bar. Sensor Music player has an auto sensor selection. Sensor Music player has a home screen widget. Sensor Music player has been powered with exclusive algorithm and sensor modes which will allow you to skip songs without the use of your screen. The sensor mode will sense the situation/the event. Sensor Music player has a wave over feature, using this feature ,you can wave in front of the device when you want to skip a song, waving twice will mean going back to the previous track. You can customize the sensor to meet your specific needs. This is one of the most powerful android music players. With this player you have the ability to manage your music and easily find all your music. This player has been designed not based on the artist but on the folder structure. It contains more than 20 backgrounds which will make your player to have an outstanding look. Designed with a powerful equalizer, you will definitely enjoy using this music player on your android device. You have the ability to browse through music by use of: genre, playlist, album,folder and also album artist. Has a lyric support. It usually scans all the lyrics file and matches the most appropriate lyrics for a particular song. Has a notification status which displays: title,artist ,album ,skip forward and a variety of status control. Has a five band equalizer. Has the ‘shake it’ feature. You will only have to shake your phone when choosing next or previous. Has a 3 simple home screen widget. Has a wide search feature which enables you to search for songs in a very easy manner. Has Bluetooth and headset controls. Though this is a 10 day free trial music player, PlayerPro Music Player definitely had to be featured in our best android music player list. This is because of the diverse features this music player and their appropriateness to fulfilling a very distinctive listening experience. You can get the pro version by purchasing it. You can liven your experience by use of artistic pictures, artwork and genre illustration which you can easily select from a variety of source. This includes, SD card folder ,the internet and Gallery. There are a variety of many skins available. You have the ability to customize your layout. You can easily view lyrics which have been embedded in the ID3 tags. Has mixable Audio effects, this includes: 5 band graphics equalizer which has customizable preset, Reverb effects, Stereo widening and volume control. Has additional plugins which includes: Pre-AMP controls, stereo widening, bass boost control, left and right volume control and gapless playback. Cross fade, this replays gain. Swipe gestures. This feature allows you to swipe album art to skip certain songs. Has a ‘shake it features. This gives your phone ability to move to the next song by shaking either top to bottom or even bottom to top. This will either play previous or next song depending on how you have customized the settings. 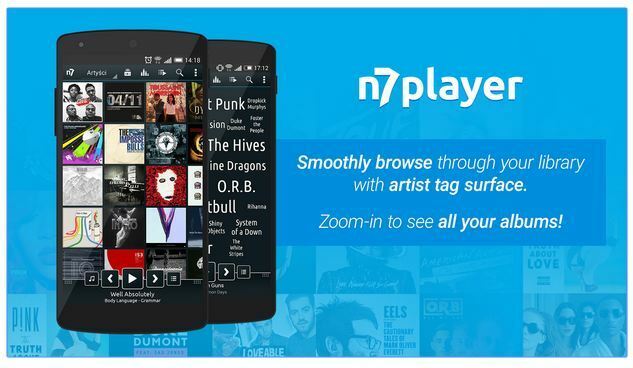 n7player Music Player is a very unique music player which has a variety of advanced features. 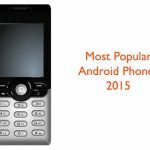 This has been noted to be a top android music player by a variety of people. There rating has actually been based on the diverse feature and also the ease of using this app.After fourteen days of installing this app,you will have to purchase a license key or some modules including Graphic equalizer, folder browser and tag editor will be closed. 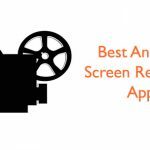 The most outstanding feature about this app is the ability to stream music videos and photos. This is possible due to collaboration with Toater UPNP/DLNA. Has a 10 band graphic equalizer which has a variety of in built presets. This will enable you to change different sound parameters. This app has the ability to play a variety of file types and audio format. This includes mp3 ,mp4,ogg,wav ,m4a ,amf ,mid ,mkv(4.0+) ,acc(3.1+) and flac (3.1+). 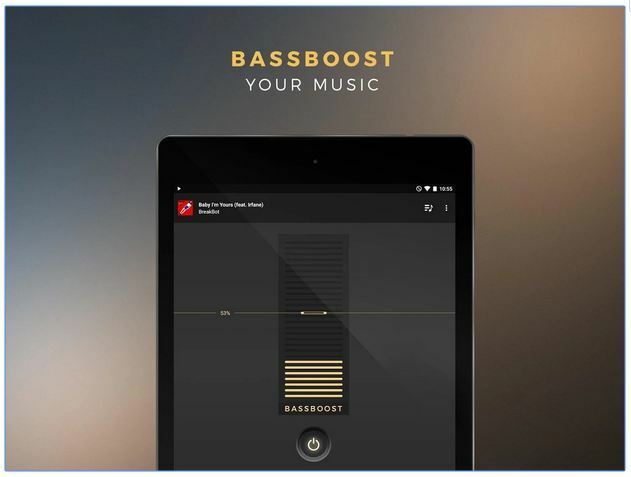 Has a variety of controls which can be used to boost the bass and reduce treble. Has SRS (device-dependent) and spatial effects or a customizable volume normalization. Has a variety of skins and themes available, this can be used to customize the appearance of the player. You have the ability to easily download missing album art and also a variety of looking cover. Has a filter folder and a restrict catalo directory to certain specific folders. This enables you to hide ,delete sounds in order to keep your library clean. Has a configurable sleep timer which has the ability to automatically turn off. Has a variety of options to tweak and also customize a variety of app parameter. You can easily control your music with use of notification for controlling your mp3. Poweramp Music player is a very recent release and has a variety of amazing features. Though this app is still in the development version, the complete version will have amazing feature since the trial version is fascinating. Has 10 band optimized graphics equalizer. This is for all supported formats, custom presets and even the embedded presets. Poweramp Music Player has a separate powerful treble and bass adjustment. Has been featured with eXpansion,balance and mono mixing ability. With this app you have the ability to play songs from your own library or folder. Poweramp Music Player has a lyrics support which has is through musiX match plugins. Can openGL based cover art animation. 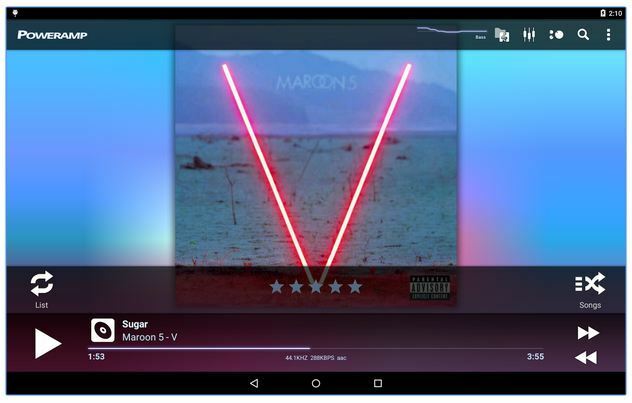 Fusion Music player app is definitely among the best android music players. Fusion Music player has a very powerful philosophy which states that nothing should come between you and your music. This is definitely all that music lovers wish for. This player has every powerful feature which is the ability to bring out related suggestions when listening to a particular song. The options will be available for streaming and free download. 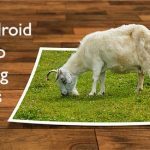 The interface design is very unique it is commonly referred to as the Ice Cream Sandwich. You will always be up to date with music by just enabling the appropriate settings. You will easily share your emotion or feelings about a particular song on a variety of social media. This includes Facebook and twitter. With the help from Shoutcast, this brings about 7400 radio station. A variety of cover art have been collected to make the experience more real. The ringer function in this app allows you to set specific part of a certain song as ringtone for a particular song. This app contains no ads to fulfill their philosophy. You can easily search for music based on album or artist. Has an intuitive search option and an instant access to a variety of online music. Has been fitted with a lock screen widget feature. Has shake and wave gestures support. 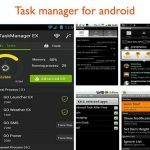 Fusion Music player has a very powerful equalizer which has 12 presets and also a virtual sound support over headphones. You can easily rate your sound and this player will create a dynamic plays list for you. Has been integrated with YouTube. Has a song visualization with a variety of multiple effects. Has weekly online top charts which have support from Bollywood. This music player app makes it very easy to discover, share and play songs on your android device. By use of their new subscription, you can listen to radio with no limits. Also enjoy playlist which have been handcrafts by their music experts. You can enjoy the use of this app by either use of the standard or unlimited version. All you songs will be stored online and you don’t have to worry about syncing storage space. This app contains no ads. You have the ability to listen to unlimited songs. You can easily create a custom radio from artist ,album or even from any song. You will enjoy radio without any skip limits. You will get recommendation depending on your taste. This app will give you a very appropriate platform through which you sync and listen to your music, radio and podcasts. This is a free to download app with the option to upgrade to a pro version. The pro version will basically unlock Air sync, appleTV, airplay, EQ and album art search. This app has been featured in a variety of major publications. This includes: Newsweek, New york times, Tenchcrunch among others. You have the ability to sync your music from your laptop by either USB or WIFI by using this player. You have access to high quality and legal album artwork. Has a smart playlist which gives you access to top rated and popular music. You can subscribe to podcasts,with this you will easily get new episodes and you can download them. You can stream video ,photos and music to PS3 ,Xbox and Sonos. You have the ability to play to WIFI speakers and also devices which include Zeppelin air and also Yamah RX-V473. Enjoy the airplay to apple TV. This app is not only beautiful, but it is also very powerful. It has been designed in a very easy to manage manner which is quite convenient comparing to the number of features it has. With this app you will easily manage your music, share it and easily find it. This app is based on folder structure and not artist or album. It will only use a very small memory of your phone and will ring a new music playback experience. With this player – You can easily browse and play a song by music album, genre, artist, song, folder, playlist and album. his player has a notify support display which will display title, album art ,play/pause ,stop and ski controls. his player has 8 kind of presets musical tone from which you can choose from, you also have the ability to manually adjust the equalizer. Real Music player has a head support.